In a bowl, mix avocado, red onion, lime juice, and tomato. Mash gently with a potato masher to mix. Add salt and chopped jalapeño/serrano pepper to reach desired heat level and flavor. Cover the surface with plastic wrap (the plastic wrap should be in direct contact with the guacamole), seal, and chill until serving. This entry was written by Donna, posted on February 6, 2010 at 11:42 am, filed under Recipes and tagged Avocado, Condiments, Mexican, Party, Superbowl. Bookmark the permalink. Follow any comments here with the RSS feed for this post. Post a comment or leave a trackback: Trackback URL. It’s a personal preference. I like it hot so usually use a mix of jalapenos for their flavor and serranos for some raw heat. Those with milder palates may want to only use a little jalapeno. That’s why I recommend you add it at the end and add the right amount needed to meet your taste preference. I also like to add some dried ground chipotle chile pepper. I’ll post a picture momentarily. I like it because I can keep it on hand without it going back and b/c it adds both smoke and heat. we also keep dried peppers on hand… dried chipotles (though we always get them whole), as well as dried arbole chiles. 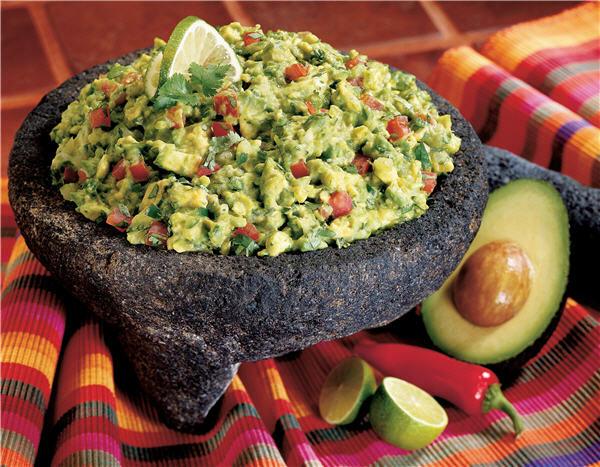 i do like the idea of using chipotle in guacamole, though…i may have to try that! i can imagine that the smokiness makes for an interesting twist on the old classic.